Last week I spend the weekend with my mama down in San Diego. Well, I say San Diego, but really, we were in Chula Vista and El Cajon. But that’s beside the point. A few months ago, I bought tickets for a worship night with one of my favorite people in the world. Kari Jobe. Interesting that I say that like I know her. Psh. I wish. Without knowing it, she is one of very few people that I look up to.. And anytime that I get the opportunity to be in the same room with her while she is worshipping, I take it. So me and my mom headed south for the weekend. I was really looking forward to the whole weekend, because my mom and I don’t get too many opportunities to spend whole weekends away together. We are super close. Close friends. And we shop together all the time, and we bounce ideas off each other daily, but she’s married. So I guess, he’s first priority. So after spending way too much money at fabric and quilt stores we headed to Shadow Mountain Community Church. And we stood in line for a long time. 🙂 We bought premiere tickets for a Q&A session with Kari and her soon-to-be hubby, which was really good! I have to say, I love her worship leading skills, but I LOVE hearing her speak! Even if its just answering questions, she’s so soft spoken and her heart just spills out of her mouth and I want to soak it all up and apply it to my life. She seems like the kind of person who talks, and people listen. They have no choice. And I begin to hear God speak. See, just that afternoon my mom and I were driving around Chula Vista and I saw this house. This house… It was perfect. It was definitely a “Jessica” house. It wasn’t quite this big or spooky looking, but this is the general idea. It was perfect. And I wanted it. 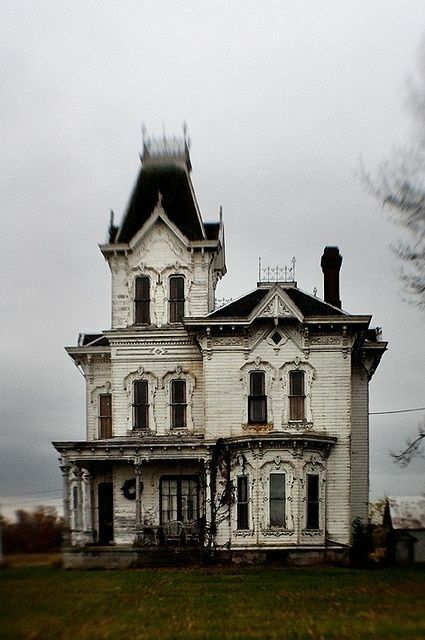 And as I began to day dream about this house, a voice crept in and started whispering to me. Well that’s confusing. That’s contradictory! How do I know what are His and what are mine? How do I let go of what is mine and grab hold of what His are? So now that I’m an adult (who probably should have read her bible more then and now) who’s worrying/asking about the same things. I have lots of desires. I’m probably almost too picky. (But when I was a teen, I was told to be specific when I prayed!) Matthew 7:7 says “Keep on asking and you will receive what you ask for. Keep on seeking, and you will find. Keep on knocking, and the door will be opened to you. For everyone who asks, receives. Everyone who seeks, finds And to everyone who knocks, the door will be opened to them.” Sooo many promises!! My mom hears all of this and basically tells me that I need to go back to having childlike faith. Believing and trusting that God will grant ALL of the desires of my heart. Of course, He’s not just going to give me everything. There are conditions of living my life for Him, and being obedient to his call. But, “keep asking and you will receive what you ask for.” Childlike faith. But how do you have childlike faith when you also feel like you never got to be a child, and have childlike faith? It’s kind of hard to develop childlike faith when at the age of 7, you were sexually abused by a slightly older friend, or at the age of 10 when your father walked out on your family. It’s hard to believe when just 3 years later your older brother made a life changing mistake and was no longer on the earth. Its hard to believe when after all of that, a boy crushes your heart and spirit to such capacities that even thinking of trusting a guy is out of the question. So how? How do I trust a God who allowed all of that to happen? How? So, I’m worshipping while Cody Carnes says that “Your Past Does Not Define You” and God whispers. Enter tears. God is the only one who knows how to talk to me in a way that makes me feel like a child who needs comforting and love. It’s amazing how easy it is to worship God after a moment like that. That is not to say that trusting and believing and childlike faith comes that easy. Not for me. Doubt has already crept back in… But I know that I need to bury myself in His word. I need to burrow so deep into his word that Satan literally has to go through my father to even breathe near me. It’s a work in progress. I still have those earthly things that I want (And maybe there’s another lesson in there that God is preparing me for) but I’m learning to walk in the promises of God. Trusting that no matter how my life turns out, whether the boy comes before the girl, or if my house is 100 years old or not, God knows me. He knows my desires and His plan for my life will make me happier than anything I could even imagine. But at the same time knowing that God wants me to express my desires to Him. I shouldn’t be afraid of telling my father what I want. He longs to spend time with me and to talk with me. So all in all, the weekend was a success! haha our hotel sucked and we felt like we were going to die from paint fumes, but we’re not high maintenance girls. We lived through it, ate some Panera Bagels on the way home and took nice long naps when we got home. It was great!! I love spending time with my mom and this trip made me want to take more small weekend trips with her!